Only worth in long run. 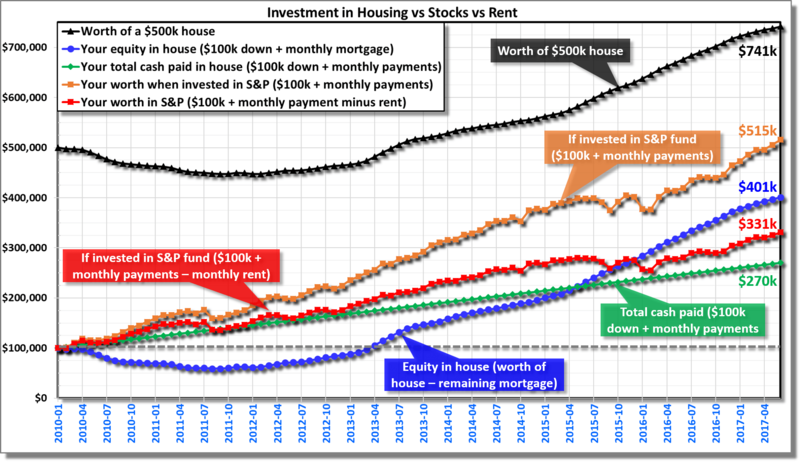 Comparison of $100k down payment vs S&P index vs rent. (Click on plot to enlarge) Comparison of different scenarios when buying a house. A hypothetical case when planning to buy a $500k house in Portland Metro (at Zip 97124) with $100k down payment and a 30-year mortgage at 4% rate. Key scenarios: (1) the worth of house increased by about 50% over the seven-and-half years; (2) the total cash with $100k down payement+monthly mortgage added $270k cash to the equity; (3) however, the equity in house will be much higher at $401k; (4) if this amount regularly invested in an S&P fund, it will end up at $515k; (5) but when a monthly rent is paid out of this payment, the growth is much lower at $331k; (6) the equity is positive only after 5-and-half years; (7) the most practical scenario is red curve when part of monthly investment is paid as rent which takes a serious bite out of the investment, however, it is still a better deal for first six years in this case. Source & comments about analysis: The data for S&P prices and dividend taken from Prof. Shiller’s Yale page; data for housing prices and rent taken from Zillow; monthly mortgage calculation done using www.calculator.net. For simplification, all the dividend was re-invested every month & no fees or taxes included. Due to incomplete data, rent calculation done based on nearby neighborhood with similar rent prices & was extrapolated for first year due to missing data.